One Man's Choice: Life Without A Stomach, Or Dying From Stomach Cancer? By simply spitting into a tube, David Fogel gave geneticists the DNA they needed to detect that he had inherited a rare gene that put him at high risk of developing what's known as hereditary diffuse gastric cancer. David Fogel with surgeon, Jeremy Davis and Michael Wach, a surgical oncology fellow at the NIH hospital. David Fogel watched his aunt die a devastating death. She was diagnosed at age 56 with advanced stomach cancer, a disease as persistent as it is painful. It took her life in a grueling 24 months. Fifteen years later, Fogel still describes his aunt's immense suffering as one of the most traumatic experiences of his life. It's a horror he would never want to put his own family through - if he could help it. Advancements in genomic research meant he could. By simply spitting into a tube, he gave geneticists the DNA they needed to detect that he had inherited a rare gene that put him at high risk of developing what's known as hereditary diffuse gastric cancer. There was no guarantee he would develop it - though chances were more than 70 percent - and certainly no time frame. But if he did, it was almost certainly a death sentence. The only way to outfox his genetic makeup was to remove his stomach. 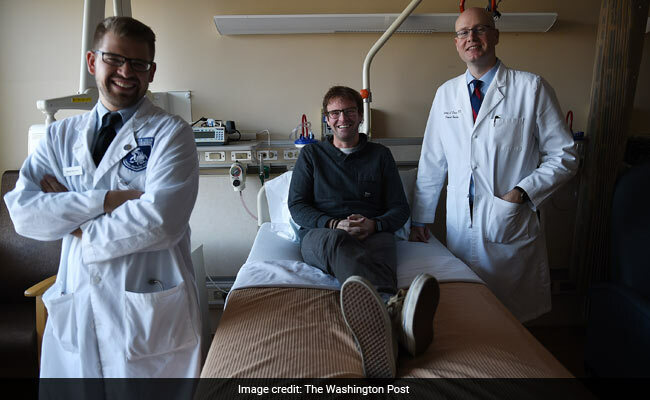 So in October, the 41-year-old father of two boys, 6 and 3, underwent a total gastrectomy at the National Institutes of Health. The doctors cut out his stomach and reattached his esophagus to his intestines as his new digestive system. "For me, it was a no-brainer getting my stomach removed," said Fogel, who lives in Silver Spring. "Being with my aunt and watching her go through the process of dying with stomach cancer, that was enough." Complete stomach removal is the type of extreme preventive procedure that has become a real option, thanks to advancements in gene science in the past two decades. Increasingly, a person's unique genetic pattern can foreshadow illness, providing a warning that can be heeded long before a disease becomes fatal. Turning to genetic markers to predict breast cancer may be a better-known application. Women with what's called the BRCA gene mutation can elect to have their breasts removed before cancer can hit. Stomach cancer is less prevalent in the United States; there are about 25,000 new cases annually, compared with 300,000 cases of breast cancer. But breast cancer has an 89 percent survival rate, while the survival rate for stomach cancer is 30 percent, according to National Cancer Institute data. It may be surprising to learn a person can live without a stomach. But the body is able to bypass the stomach's main function of storing and breaking down food to gradually pass to the intestines. Absent a stomach, food consumed in small quantities can move directly from the esophagus to the small intestine. It has been possible to detect the gene for stomach cancer since the late 1990s, when a New Zealand scientist began researching why so many people in one indigenous community were dying of the cancer. After 18 months of sifting through the Maori people's DNA, Parry Guilford, a professor at the University of Otago in Dunedin, New Zealand, discovered a link between those carrying a gene mutation called E-cadherin and those who got the disease. Because stomach cancer is uncommon in the United States - although it is the fourth-leading cause of cancer deaths worldwide - stomach cancer prevention has not been a leading research priority. But Guilford, in an interview, said every week or so he's hearing from an American family who has tested positive for the gene mutation and wants to know more. It was late last year when a distant relative informed Fogel's family of the genetic test. Fogel, his sister and his cousin - his aunt's son - got tested. Fogel was the only one of the three to test positive. But three cousins in Kansas City all had the marker, too, and another had already been diagnosed with late-stage stomach cancer. Although the news was a blow, Fogel, who owns a coffee and record shop in Silver Spring, said he looked at his choices pragmatically: He had an opportunity to save his own life, a chance his aunt never had in her day. He enrolled in an NIH clinical trial run by oncologist Jeremy Davis that will track him and his family over time. One day, Fogel's two sons will be tested for the hereditary gene. If they test positive, Davis hopes that by then he and his team will have discovered other preventive treatments than stomach removal. After Fogel's Oct. 11 surgery, NIH pathologists checked his stomach for signs of precancerous cells and found none. More than 90 percent of the time after these surgeries, they do find early-stage cancer, Davis said. That Fogel was clean doesn't mean he would not have developed cancer, but it was a surprise to the patient and the doctor. Still, Fogel said he has no regrets. "It just means I'm beyond the one in a million my mom always said I was," he joked. A scar from the surgery to remove David Fogel's stomach. Fogel had waited almost a year after finding out he carried the gene to go through with the surgery. He made a bucket list of things he would never be able to do again, like entering a pizza-eating competition. Before the date of his procedure, he downed a pint of Ben and Jerry's ice cream. He'll never be able to gorge like that again. Even when he's cleared to expand his diet beyond bland foods such as hard-boiled eggs and peanut butter crackers, he will have to eat in extreme moderation. It's made a little easier because he now never feels hunger. He has to set an Apple watch to remind him to eat or drink a little something every hour. On a recent day, he finished the last few bites of his son's cereal and felt the morsels back up in his esophagus. He drank some water to try to flush them down, but instead he felt the liquid pool on top. "I used to be your typical iron belly," he said. "I would and could eat anything." So are the holidays, with their overindulgence, difficult? Bypassing the Thanksgiving feast wasn't as difficult as Halloween, when he couldn't dig in to his sons' candy haul, he said. For a person without a stomach, sugar is high on the banned list because it can move so quickly to the intestine that it creates uncomfortable effects. During a return visit to NIH a month after his surgery, Fogel was all smiles and high spirits, willingly showing off the four incisions on his abdomen and a photo of his excised stomach. Davis walked into the room sipping coffee from a Bump 'n Grind mug - Fogel's shop - and the oncologist and patient greeted one another like longtime friends. Davis boasted about the gnocchi and Nutella cheesecake he'd had for dinner the night before. He patted his stomach and said, "I carry a little extra." "You know what you can do?" Fogel said with a smirk. "Get your stomach removed."